If finding something to do during the holidays is getting a bit difficult, how about a road trip? During the past few weeks the travel pages have featured some southern journeys to fill in those summer days - our final journey is Oamaru to Naseby. Before leaving Oamaru, we made two very necessary culinary pit stops. The first was at the Whitestone Cheese shop in Torridge St. I have it on good authority that the cheese rolls there are some of the best in the country. It's a big call, and one that I admit I didn't put to the test this time as I was in search of one thing only - their Mount Kyeburn aged cheddar. Drool. Moving from savoury to sweet, we headed along the main road to the Rainbow Confectionery factory shop. In one guise or another, these sweet-makers have been in business since 1884, and it shows - they really know what they're doing. We did a big stock-up; a road trip needs sweets after all - for me it was chocolate fish and fizzy lollies, while Jane was all about the cola bottles. North from Oamaru, we headed for the Waitaki River. Just before the river lies Riverstone Kitchen, which focuses on local and seasonal food. To be guaranteed a table, call ahead and book, as its super-popular. Along from the restaurant is the wonder that is Riverstone Castle. A private home, the castle makes for quite a bizarre sight in this part of rural Otago, but you have to take your hat off to Dot, the owner, for having the vision and the tenacity to make it happen. The castle isn't open to the public so you'll just have to marvel at it from the road. Crossing the bridge over the braids of the Waitaki River, we veered briefly into Canterbury in order to drive along the northern bank of the river towards Hakataramea. If I'm honest, there's not a whole heck of a lot to see or do on this bit of the drive - but that's part of the joy of it. There was hardly any traffic and meandering along beside the river was lovely. It takes about 40 minutes of peaceful driving to get through the river valley from Glenavy to Hakataramea, then across the bridge back into Otago and the town of Kurow. OK, so lets just address the elephant in the room. Yes, Richie McCaw is from Hakataramea. Yes, there's something of a shrine to him in the (excellent) Kurow pub. Yes, that might be him flying that helicopter/glider that just flew over. Now that's out of the way, I want to talk about another rugby hero (well, of mine). On Kurow's main street is the Valley Cafe. They have a beautiful big garden and they make excellent cheese rolls and very good coffee. The cafe is also home to Game-Keeper Products, a charcuterie and merino meat specialist where they make salami as good as any you'll find in Europe and an excellent range of sausages. Even better, the place is run by none other than Steve Hotton, the legendary stalwart Otago prop from 1983 until 1993. While were talking European products, the Waitaki Valley also happens to be one of New Zealand's newest wine areas, so if you're looking for a fancy drop to go with your cured meats, there are a few options as you head back along the valley. My favourite spot to stop is The Pasquale Kurow Winery, as they not only have some lovely wines but also make a knockout limoncello. They have tastings available, and they also have a cafe that does a fine range of platters. 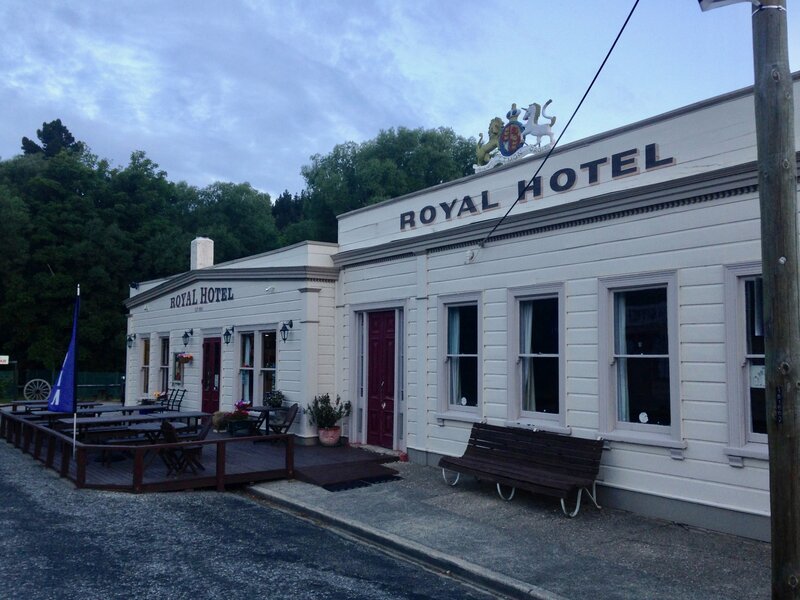 The next stop on our trip along the Waitaki was in the lovely wee village of Duntroon. The locals here have worked hard to preserve their heritage buildings and it's well worth having a wander around the restored Nichol's Blacksmith Shop (where they sometimes have a live blacksmith working). Out the back of the smithy's is the Brewery Hole (so called because the water was once used by a brewery in the town), an impressive sunken limestone cavern and water hole that gives access to an underground stream network. What's found underground around here is what has truly put Duntroon's name on the map, and a map is what our next stop was all about. Up the road, we called into the Vanished World Centre to buy a map of the Vanished World Trail. It turns out that the Waitaki Valley and the broader sweep of North Otago are absolutely heaving with fossils and rock formations that tell the story of the pre-history of this land. The trail is self-guided, hence the map, but the centre is absolutely bulging with information about the geology of the region and its fossils - we're talking whales, dolphins, sharks and penguins that are millions of years old. It's absolutely fascinating. Back on the road, we headed inland towards the Elephant Rocks. They're pretty much what it says on the box: a whole bunch of massive limestone rocks sitting in the middle of a grassy paddock that look like grazing elephants. Its pretty cool. Even cooler, so I'm told, if you're a fan of the first Chronicles of Narnia movie, as they were used as a set for Aslan's camp. It's time to head into the hills. Just after the Dansey's Pass Holiday Park, the tarseal runs out and the gravel road starts to climb. The pass, which takes you over the Kakanui Mountains, tops out at 935m above sea level and driving it, I feel every single one of them! William Dansey, from whom the pass gets its name, first crossed the pass in the mid-1850s along with three others. The pass was then used to move stock between Central Otago and the Waitaki Valley. Before we got into really gnarly country, we made a quick stop-off at Danseys Pass Lavender, which is about 30 minutes' drive from Duntroon. The high altitude, fresh air, hot summers and cold winters are what makes the lavender thrive here. After stocking up on calming lavender products to help me out for the rest of the drive we carried on our way, but it's a lovely spot to have a picnic and just take in the scenery if you fancy a longer break. A bit further along, we stopped and I had a quick swim in the creek that runs alongside the road. It was a hot day, and it needed to be - that water was straight off the tops and bloody cold! Between that and the lavender, though, I was relaxed and alert for the climb to come. The road is narrow and winding, and you have to keep your wits about you for roaming sheep (as you're driving through paddocks, pretty much) and vehicles coming from the other direction. For an alpine pass, it's a surprisingly busy road - although it wasn't nearly as busy as the time I drove over it and about 300 cyclists came towards me at varying intervals. That was an interesting drive! Apart from the living distractions, some of the drops at the side of the road look pretty dangerous - but it's best not to examine them too closely. The landscape around here is classic South Island high-country. There's tussock, tussock and more tussock, and most probably some Spaniard and matagouri thrown in the mix. It sure is beautiful and quiet up here. Eventually, the road starts to descend and winds its way towards the plains of the Maniototo. The moment I know I'm almost home is when we reach the historic Danseys Pass Coach Inn, which was built in 1862 largely by a stonemason who was paid for his work in beer. Nowadays, it's a boutique restaurant and lodge a far cry from the wild drinking den it was back in the day, I'm sure. From here, it's a short drive down to Kyeburn Diggings, an old gold-mining area still dotted with the remains of the rushes of the 1800s, and on to the wonderfully historic town of Naseby, where my ancestors settled when they arrived in New Zealand in the 1870s. Naseby was originally the main town of the Maniototo region, but when the railway came that title shifted to Ranfurly. For many years, Naseby was the smallest place in New Zealand to have its own mayor. Arriving in Naseby in the early evening, it's not difficult to imagine what it must have been like back in the gold-rush days. There are still two excellent pubs here, the Royal Hotel (which has just reopened after a refurbish) and the Ancient Briton, but back then there would have been many more. The fact that there was a clockmaker-watchmaker trading here says something of the wealth that must have been floating around. The watchmaker's shop and a couple of other heritage buildings now make up part of the excellent Maniototo Early Settlers and Jubilee Museum. There's plenty of information about the gold mining and sheep farming that brought people and money to this area. The town itself is lovely to just wander around, checking out the old buildings. In one of them, you'll find the excellent Black Forest Cafe. It has been serving up strong coffee, massive scones and the best bacon and egg pie since ages ago. Actually, the bacon and egg pie is the thing that the Beckers, who own the place, are second-most famous for. The first is curling. There's pretty much not a New Zealand curling title that someone in the Becker family hasn't held, so its quite handy that they live near New Zealand's only purpose-built indoor curling rink. I was super-sceptical about my ability to curl, given I have zero co-ordination and even less ability at playing bowls, but we rocked up to the Naseby Indoor Curling Rink to give it a go anyway. It turned out to be absolutely hilarious and a whole heap of fun. I heartily recommend a visit to give the sport a try - even if it's only so you can be all knowledgeable come the next Winter Olympics! Road: Mostly pretty easy driving on sealed highways, with the exception of the Danseys Pass Rd, which is a pretty challenging drive on account of it being across a high-country pass, on a narrow gravel road. If you’re thinking of going across it in winter (or in bad weather in summer) check the weather forecast first because no-one needs to get halfway up there and get stuck in the snow. Highlights: Lollies, lollies and more lollies at Rainbow Confectionery Company; eyeing up helicopters in the Hakataramea; stretching your legs in Duntroon; going back in time a few hundred years on the vanished world trail; enjoying the best bacon and egg pie anywhere at Black Forest Cafe; having a crack at curling.